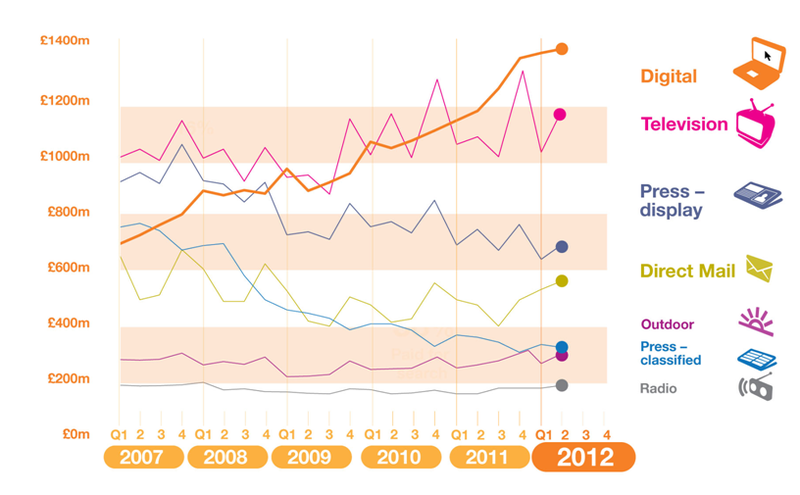 The ad spend trends from the first half of 2012 give us some data to prove what we all know within the digital industry – not only is digital now the single largest part of all advertising spend (28% over TVs 26% of all advertising spending) but it continues to grow at a recession-defying pace. With the advertising market overall predicted to have grown by around 3% over the whole of 2012 (source Campaign), digital advertising jauntily grew by 12.6% year on year in the first half of 2012, with paid search maintaining its place as both the largest portion of this (59%) and the fastest growing (15.9% year on year). This of course is great news for those of us in this industry – our jobs are relatively secure in a world where many other sectors are shedding staff in droves. What these figures don’t tell of course is the underlying story of staff churn and salary inflation created by these figures. Having worked in digital since 1999, and agencies since 2005 I’ve been a grateful career benefactor of digital supply and demand, and also seen the impact of these issues first hand as manager of digital and search agency teams. When I joined MediaCom to run the UK paid search department in 2011 I inherited a team of 38 people that had been churning at a rate of over 75% for the last two years. The reasons were many but not unfamiliar – a great training ground created a bank of very employable staff, who were approached weekly by recruitment consultants/other agencies and offered hugely tempting salaries – which are easy to afford if you don’t have to fund the costs of training or unproductivity for new and management staff during the training process. Add this to the youth of the agency sector and the fact that most graduates start with a huge debt burden, and it’s not surprising we have the perfect storm for huge staff churn, with all its negative effects on team morale, consistency in client work and time spent recruiting rather than making our teams and our work better. Inc.com has a great article about staff turnover and why it should worry you, and it’s mostly about the vicious circle effect. Churn begets churn, and these factors are just amplified in an industry that’s growing at such an enormous pace – you are running just to keep still, so larger-than-average churn just makes the job even harder. My approach has always been to treat business as personal. Every decision that we make has an impact on our colleagues, clients and the wider community and it pays to remember that the people you meet will be around to help or hinder you for the rest of your career. Now that any mishap in business or personal life can also be broadcast across the entire Twittersphere within moments, it’s even more important that we are personally involved and authentic in all our professional relationships –besides – who wants to live 1/3 of every day as someone you’re not? Structural foundation: No organisation can work without the building blocks of what, who, and how. Each role within a team needs to have a job description, a personalised set of objectives for each member (based on their client mix, their skills and career aims, and the market’s possibilities), that ensure that the client’s and business needs are fulfilled. In something as fast changing as digital, with new technologies and partners, the operational tasks that make up the objectives are likely to be changing on a regular basis, so as a minimum 1:1s are needed every 3 months to check that things are on track and the world hasn’t changed under our feet. The detail of the steps may change but career progression needs to be clearly signposted and recognised when it is achieved. Nothing is more demotivating than the goal posts moving mid-way though the game – to your detriment. The personal approach: One of the best known theories in psychology is Maslow’s hierarchy of needs in which Maslow contends that once we satisfy our basic physical needs (food, shelter), we move onto satisfying social and status needs, and finally work our way through to self-actualisation – and hopefully finding a real purpose in our lives. Taking the workplace as a microcosm of society, we can have people at multiple levels of this hierarchy within any one team, and crucially it will not necessarily correlate to their career maturity. There will be some who are grateful to just have an income, those who desperately need more money, some who embrace the new and require fast progression or a new job title, and those who need flexibility around their family needs or just want to be with their friends. As a manager our role is to figure out what each team member’s drivers are, and how to satisfy those within the realms of our professional and personal capabilities. The point is that there is no all encompassing perfect approach – it is different for each member of staff, and keeping up with them all certainly keeps us on our feet. Happily my tenure at MediaCom search saw the staff churn levels from 75% to 28% within less than two years, so I am taking that as a sign of success. Oh, and remember – you can’t win them all. When people do leave; as they sometimes will for reasons outside your control; let them leave with a smile. You will come across them again – I promise – and you’ll be glad to. This entry was posted in Advertising Agency, Media, Paid Search, Search, Staffing and tagged adwords, churn, digital media, ppc, staffing on 26/03/2013 by melmackuk.